Seven 4th of July Tips for the greatest weekend ever! This weekend is a wonderful 3-day holiday weekend to celebrate this nation’s Independence Day on the 4th of July. We should all take the time to remember our past, present, and future veterans and the freedom we have in our country. Enjoy the weekend and here are our top 7 tips for the 4th of July weekend. 1. Have fun! Not only will this help out to decrease the stresses in your life but it will help you get out to meet more people. Whether it is fishing, golfing, swimming, or whatever you like to do to have fun, just get out there and enjoy it. Take a break from your worries and enjoy your family and friends. 2. Be safe with those fireworks! Firework are amazing but can be dangerous. Follow the instructions for the fireworks and be sure to shoot them in a safe direction. Be sure to have a bucket of water to throw fireworks in after you are done shooting them off. I know that 4th of July and Thanksgiving are usually the busiest days of the year for local police and firefighters, so be classy and help them with their jobs. Furthermore, have eye protection and try to light only one firework at a time. 3. Drink Water. It should be in the 80s for the weekend but I am sure the heat index will be higher. We need to drink some water especially if you will be outside all day in the heat or being active. We do not want to get dehydrated so try to drink a lot of water. Usually it is 8 glasses throughout the day or half your body weight in ounces. 4. Be aware of your neighbors and pets. Be aware of any veterans or persons that may have Post Traumatic Stress Disorder, as loud noises and fireworks can stress them and increase symptoms of the disorder. Look for signs up around you that may be to identify if someone lives in your neighborhood. Pets usually are scared from all the loud noises going off continuously throughout the night, so bring them inside. The dog might enjoy being inside with the air conditioning on. Furthermore, if your dog is outside running around while you are shooting off fireworks, they can run off or worse, get burned by a bad fireworks display. 5. Try some healthier food. This is BBQ and grilling season. Try grilling fruits and veggies or a new rub on your steak or chicken. You can experiment with new grilling techniques on watermelon or even lettuce. Try to incorporate some fruits and vegetables into your dinner plans. Fruit or vegetable salads are popular during the summer and are healthier for you than those bags of potatoe chips. 6. Wear sunscreen. It is important to wear sunscreen if you are going to be outside under the sun all day. You get vitamin D from being outside getting sunlight but you can get enough from being outside for a few minutes so we usually recommend to go outside to get ready and then spray on your sunscreen. Make sure to read the label because you might have to put more sunscreen on later in the day. 7. Get in the water! If you get hot, get in the water and go swimming or boating. It is a easy cool way to stay cool. Just make sure watch for any bad weather. Do not dive head first into the lake, due to the unknown ability how deep the water is. Furthermore, watch for currents and wear the appropriate life jacket depending on your age & weight. Have fun this July 4th and celebrate our country’s freedom. Those of us here at Fletcher Chiropractic in Lincoln, Ne. wish you all a happy Independence Day! See you all next week. 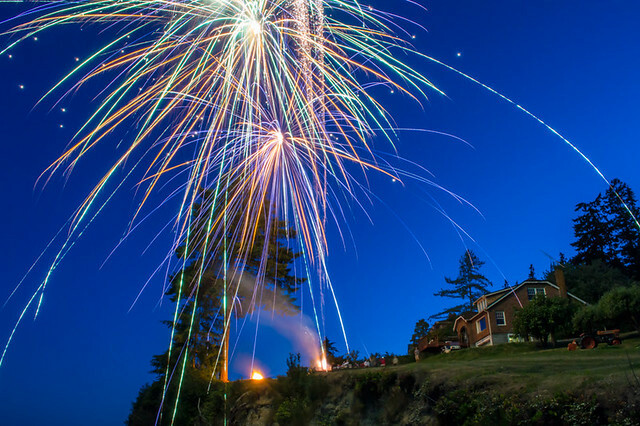 Posted in Uncategorized | Comments Off on Seven 4th of July Tips for the greatest weekend ever! Myofascial pain syndrome is complicated and multi-focal. The ultimate goal of myofacial therapy is to loosen and stretch the fascia so that it – as well as other structures – are able to move more freely, thereby restoring motion and relieving pain. Myofascial therapy is sometimes referred to as myofascial release therapy and/or myofascial trigger point therapy. Fascia is a layer of connective tissue and is a part of the support structure of spine and musculoskeletal system. In addition to the multitude of bones and joints that make up the spine, there is also a network of layered, interwoven muscles. These muscles exist to move and stabilize the spine, assist with the movement of the shoulders and arms, and aide respiratory efforts. The best way to envision the fascia is as an expansive web that runs all throughout the body – basically like a layer of connective tissue (similar to that of a tendon or ligament) that begins underneath the skin and extends to deeper layers, too. In a normal, healthy state the fascia is relaxed and supple – not unlike the weave of a loosely knit sweater – and helps keep muscles gliding smoothing as well as preventing them from adhering to other structures within the body. However, when restricted, the fascia becomes rigid and can create tension, pulls, knots – sometimes at a pressure as great as 2,000 pounds per square inch. The fascia is comprised of three layers: the superficial fascia, which lies directly below the skin (this layer stores fat and water and allows nerves to run through it which, in turn, allows muscles to move the skin); the deep fascia, which surrounds muscles, bones, nerves, and blood vessels; and the deepest fascia, which is found within the dura of the cranial sacral system. “Myofascial Pain Syndrome” is the term used to describe the development of myofascial trigger points and/or myofascial adhesions, which can occur with injury, postural stress, or overuse. Myofascial tightness can play a significant role in creating both malfunction and pain in the structure of the spine, the extremities, and the organs. Chiropractors treat myofascial pain syndromes such as myofascial trigger points or adhesions with manual myofascial therapy. This therapy normally includes the use of direct pressure upon the trigger point, or the use of active anchor-and-stretch myofascial release techniques. Myofascial pain has two main sources – the first of which is pain that’s generated via the skeletal muscle or connective tissues that have been “bound down” by tight fascia. Pain can also originate from myofascial tissue that has been damaged, which often occurs at a “trigger point”- this is where a contraction of muscle fiber has occurred. Regardless of the cause, the resulting restriction and/or contraction inhibits the blood flow to the affected structures which, in turn, exacerbates and continues the cycle until the area is treated. -Pain in any part – or parts – of the body, including back pain and headaches. Myofascial Release (MFR) Therapy focuses in releasing shortness and tightness of the muscles. Many people seek out myofascial treatment after an injury resulting in lost flexibility or function, or when dealing with chronic, ongoing pain within the soft tissues throughout the body. And, while specific releases to different parts of the body may vary, they typically include a gentle application of pressure – or a sustained, low load stretch – to the affected area. Progress is then gauged by the level of increased function or motion, and/or a decrease in pain. If you’re suffering from pain – be it myofascial or otherwise – please don’t hesitate to give us a call! The providers here at Fletcher Chiropractic in Lincoln, Nebraska are highly skilled in treating a variety of conditions and will work with you to treat both your pain and its underlying condition. Sleeping positions: What is best for your body? We spend nearly one-third of our lives sleeping and it is vital to our health. You recharge your batteries with sleep. If you don’t get enough sleep or sleep wrong, it can affect you by making you tired or creating some sort of pain in your body and back. According to the National Sleep Institute, nearly one-half of Americans have complained about their sleep at some time in their lifetime, stating symptoms of fatigue, achy muscles, and sleeplessness. So what is the best way to sleep, you might ask? Well, there are 3 main types of sleeping positions: back, side and stomach sleeper. The best position depends on the person but there are better positions than others. The best (within reason): Sleeping on your back. Long story short, sleeping on your back allows your body to put water in your vertebral discs. This is why we are actually taller in the morning. You may have more of a change of snoring when sleeping on your back. Other people can’t sleep on their back due to a deviated septum or sleep apnea as your tongue and neck create a smaller airway for breathing and you stop breathing. Back sleeping helps those who have neck pain as it limits rotation and lateral flexion of your neck and allows neck muscles to relax, keeping the natural curve of your spine. When sleeping on your back, place a wedge or roll/pillow under your legs, with knees bent; this helps to reduce the pressure on the lower back and relax the muscles. If you have sleep apnae, consider sleeping on your side to help reduce the chance of snoring or difficulty breathing. With side sleeping, the great debate is to sleep on your left or your right. This depends on the comfort of the patient. Sometimes it might be better to lay on your left side as it can relieve heart burn symptoms or for pregnancy. The thing that we always recommend with side sleepers is to make sure your pillow is just right for your head. If you have a big fluffy pillow, it can make your head tilt upward whereas vice versa if the pillow is too soft so your head tilts downward. You want to have a pillow height that supports you from the tip of your shoulder to the start of your neck. The other thing is to put a pillow between your legs at your knees or hug a body pillow, so you do not put stress on your legs and pelvis and limit hip rotation. However, if you have shoulder or hip problems, side sleeping can increase pressure on them and make pain worse. The fetal position would be the only side lying position to avoid as it brings your body into flexion which mimics sitting. Increased flexion brings stress to the lower back and lumbar spine. Belly or stomach sleeping is the worst way to sleep. It provides no support for your back and spine. It also put your body in awkward positions. In order to breath, your neck must rotate 90 degrees to one side or the other so that you can breath. This rotation means that your muscles are not allowed to relax during sleep and they can develop into trigger points or spasms as you continue to feed into that particular muscle pattern. The best tip to try is to do what is natural to you,but hopefully it is sleeping on your side or your back. A lot of people say they move around to all sorts of positions but try to sleep on your back or side; it is the healthy thing to do. The other tip I can suggest is to make sure your mattress is not older than you. I know a lot of people have really old mattresses, which break down after time. You should get a new mattress every 8 to 10 years. Sleeping is where we spend 1/3 of our lives so why not make it the best time. Follow this tips for a better night’s sleep which can lead to a better day. All of us here at Fletcher Chiropractic follow this advice and are ready to help if you have any questions. Stay tuned for a follow up blog on what type of mattress is best. Have a great day and a better night’s sleep. Posted in Blog, chiropractic, Muscle | Comments Off on Sleeping positions: What is best for your body? Ticks? Yuck! What you can do to help avoid ticks and Lyme disease. ‘Tis the season for hotter weather, being that it is basically summer and we will be outside more. We go biking, riding, camping, fishing, golfing, going to baseball games, etc. I am sure we all do more activities outside in the better spring and summer weather. However, there is something that we need to watch for when being outside and that is ticks. Ticks are basically looking for a host to get blood for food, long story short. Most of the time you won’t even feel the tick on you because they are sneaky. When they attach, their saliva has analgesic properties that doesn’t allow you to feel it bite on, so be careful. Ha, I did remember something from zoology! I have seen this topic on the news lately but I have had a few people ask about ticks lately. So here are some great tips for helping to decrease your chance of a chance encounter with a tick. When you go outside, expect to find ticks especially with outdoor activities. Ticks like wooded areas and are common place at lakes and ponds. Try to use a natural or regular insect repellent to help protect yourself. Try to avoid tall grass and heavily wooded areas because you can find ticks there plus maybe snakes too. I strongly dislike snakes. There are also repellents that you can get specifically for clothing and shoe wear. It is a good idea to wear a ball cap to protect your head. Wear long sleeves and jeans if working in tall grass. When you come back inside, make sure to check yourself and your clothing for ticks. Check everywhere on your body and they are usually pretty easy to spot, but they can be small babies so be through. You might need someone to help you especially if you have one in your hair but that being said, make sure to check your ears, back and belly button, too- just as an example. Remember, they can go anywhere. If you have found a tick, pull it straight out with tweezers and as close to the skin as possible. Then make sure you watch for signs of an illness like a fever or a rash. Look especially for the bull’s eye rash and it doesn’t have to be in the location of the tick bite. We do not want you to get a tick borne illness such as Lyme disease or Rocky Mountain spotted fever, based on your location. Ticks can spread 14 different diseases. If you have any doubt or questions, call your local healthcare provider. Some tips for the home is to do the basics when it comes to landscaping. Do not let your grass near your recreation area get too terribly tall and no brush around the house. This would go for stacked firewood too. You can also spray your yard with an insecticide repellent or you can find some natural alternatives too. Also try to discourage deer from entering your yard during this time of year because they are a carrier for ticks usually. However, this might be different story during hunting season. Finally, make sure to contact your local veterinarian or store about different things to protect your pets from ticks. So watch out for them this spring and summer and if you have any questions, contact your local primary care provider. You can also find information on CDC website. We are always on the lookout of important information and to advise our clients on healthy and wellness topics. At Fletcher Chiropractic, we care about the whole you- body, mind and soul. Have a wonderful day!! Make sure to follow us on Facebook too! Posted in Blog, Public Health | Tagged bulls eye rash, fatigue, Fletcher Chiropractic, lyme disease, prevention, public health, ticks | Comments Off on Ticks? Yuck! What you can do to help avoid ticks and Lyme disease. Pregnancy and childbirth are truly wonderous events. And, while we know that childbirth in and of itself isn’t the most comfortable of events (and, yes, we know, we’re putting that VERY mildly), the strain that pregnancy puts on the body can be problematic as well. The average weight gain in pregnancy is 25 to 35 pounds and when you combine that with the stress that a growing baby can place on the body, it’s no wonder that back pain is such a common complaint amongst new and expectant mothers. In fact, it’s estimated that at least 50% of all expectant mothers will develop low back pain at some point in their pregnancy – especially during the later months, when the baby’s head is pressing against the back, legs, buttocks, and sciatic nerve. For those who had back troubles pre-pregnancy, the pain they experience during those nine months can be excruciating. Why is this? Well, aside from the weight gain, the growth of the baby dramatically changes the mother’s center of gravity, thrusting it all towards the front of the pelvis. During pregnancy hormones are released that aide in loosening ligaments throughout the body, including those attached to the pelvis. So, even though a woman’s body is designed to carry a child, the additional – and unevenly displaced – weight greatly increases the stress on her joints. The problems continue as the baby grows in size – the curvature of the back becomes more exaggerated which, in turn, places additional stress on the intervertebral discs. As chiropractic care during pregnancy continues to become more mainstream, more and more women are realizing the immense amount of relief that can be provided via adjustments and what not. Chiropractic care can be especially helpful for those women with pre-existing back conditions who are attempting to avoid taking additional medications during their pregnancy. And, it’s not just adjustments that chiropractors have the ability to offer – doctors of chiropractic medicine are able to provide a wealth of assistance, including nutrition and exercise advice to help achieve the healthiest pregnancy possible. Chiropractic care has also been reported to help with easing labor pain and may help achieve a quick labor. Chiropractic care can help after the little one has arrived, too. In the months following labor and delivery the ligaments that loosened up so much during the pregnancy begin to tighten back up again and, if possible, working with patients prior to that happening – to ease muscle tension, shoulder problems, headaches, etc – can be of great benefit. Pregnancy and motherhood are a beautiful time to be savored and enjoyed – not endured because of pain and discomfort. If you’d like more information on how chiropractic care during pregnancy – and beyond – can benefit you, please don’t hesitate to give us a call…the providers here at Fletcher Chiropractic in Lincoln, Nebraska are here to help you through! Summer is coming and during this time of the year, we hear a lot of talk about diets, weight loss, and swim suit season. Diet and exercise are the best way to loose weight safely. However, boredom and inactivity can set in which can lead to a sabotage of the best laid plans. Try some of these following tips to help get healthier and enjoy your summer. 1. Drink more water. Water does the body good. It hydrates your body and helps push toxins and soreness out of your muscles. You should try to at least half your body weight in ounces of water a day. 2. Add foods you like. Eating foods you like that are healthier like fruits and vegetables, you are more likely to eat more and not have the urge to eat those unhealthy food like potato chips and sweets. 3. Walk. Walking is a great low intensity exercise that most people can easily do. Walking helps burn calories but it is good movement for your spine and joints. Walking around the house, around the block, the mall, or even parking away from the store when doing errands is exercise. 4. Split meals. When going out to eat, try to split a meal with a friend, significant other, or even just taking half of the meal home to eat the next day can help limit and control portions. 5. Use smaller plates. When using a smaller plate, it gives your mind a visual that your plate is full and then helps to trick your mind into thinking you are fuller and in return, less hungry. 6. Eat at the same times daily. By creating a routine, you give your mind and body a schedule to follow so that you don’t have the highs and lows of blood sugars and you lessen the change of hungry pains/cravings. 7. Get involved. When we get bored, most people eat more. By getting involved in a club, sport, activity, or doing something you enjoy, you get out of the house, out of your head, and away from your appetite. 8. Use your TV time for exercise. We sit in front of the TV a lot these days and as a whole, the population is not getting enough exercise, so why not combine them. Perform exercises during commercials or try using a exercise ball to sit on while watching television. 9. Ditch the salt and sugar. Sugar and salt are essential for our bodies to function but when you get more than what we need, they are a huge reason for weigh gain. Replace salt with health spices like turmeric, curry and cumin. These spices are partially anti-inflammatory and help to keep things tasty. 10. Keep a journal. Keeping a food journal can be a pain but it does give you and your treating medical professional an accurate and truthful description of what you are eating and how you are feeling. You do not have to always count the calories even though that gives you a good idea too. Use an app on your phone, a small notebook in your pocket or your computer, but doing it for a week or two can help see where improvement is needed. It also can give you an idea of how much you go out to eat. At Fletcher Chiropractic in Lincoln, Nebraska, we strive to provide the best care and advice possible. Please seek out a medical profession for advice on healthy weight loss and nutritional consultation. Does Technology Cause Back Pain? I was in a mental fog. I couldn't think or concentrate and was not doing well.Following acupuncture treatment: I am much better. My mind is clear and my work performance has improved. Julie A.